Aim for a deliberate, but nonchalant look! See the examples in the photos and video below. The examples below show befores and afters for a variety of my outfits. I've included adding accessories so you can also see how a simple necklace can make an outfit. 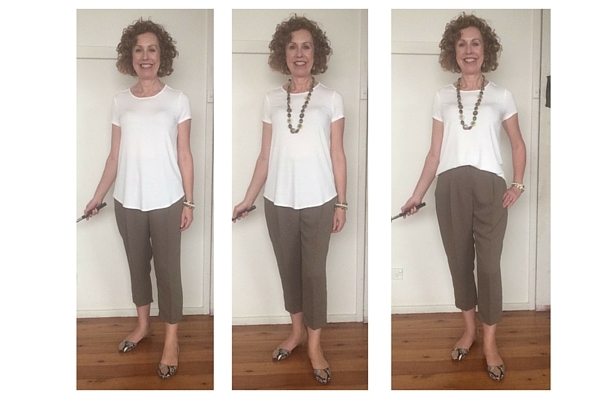 Can you see how much more pulled-together the outfits look when the partial or half tuck is used? 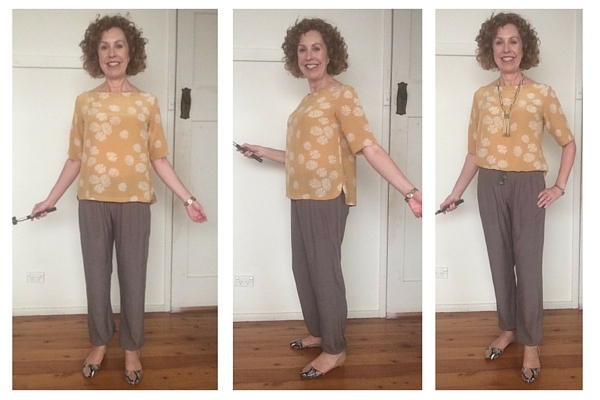 The half tuck on a hi-lo topSee how my legs look longer and the outfit is better proportioned with the tuck? 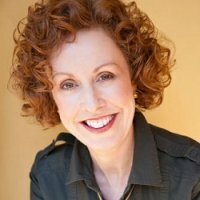 Watch this video by fellow Australian Image Consultant, Imogen Lamport, to help you master the technique. As you can see this style of tucking creates quite a casual look, so it won't work in most business environments. It will only work in very casual or creative businesses. If you're not in one of those environments keep this look for your leisure outfits and perhaps try a full tuck (the whole of the top tucked in) to control volume--perhaps experiment with pulling out a little of the top to create a blouson style. 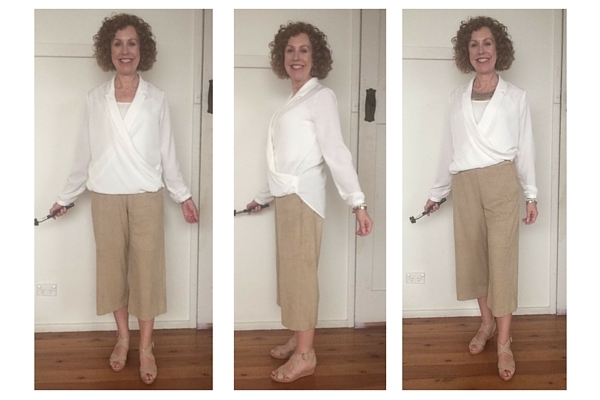 Make sure the tucked fabric is securely anchored in your waist band so it doesn't keep falling out. However, not so far in that it looks silly! Pay attention to the shape you create with the tuck and the effect of that on your body. For example, make sure a straight line doesn't fall at or just above the widest part of your thighs or hips, unless you want that area to look larger. This is particularly important where there's a medium to high contrast between the color of your top and your bottom. This styling technique doesn't work for everyone. It may be too fussy for your personal preference, for instance. Or it may call attention to a part of your body that you'd rather hide. However, give it a try. 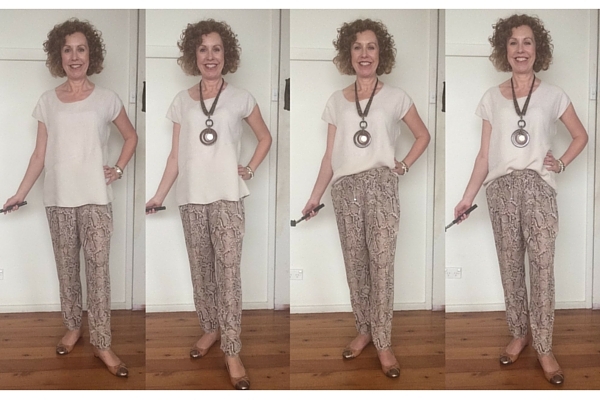 It only takes a little practice to see what works best with particular outfit combinations and on your body.